My son inspired this story. But mostly I am writing about my feelings. I no longer pretend to be happy. My challenge is to allow myself to feel – that includes joy and sadness. It has been my “habit” to suppress pain and that left me numb for many decades. I am trying to form a new habit! When I began my blog in 2010, I wrote to express things that I kept deep inside and didn’t speak about for years. I wrote about Jason, my son who died in 1992. I also wrote pages and pages about my other children and their challenges. For countless years, I devoted all of my energy to fighting the school district on their behalf. I cried so many tears for all of my children. Perhaps being a fierce advocate was a way for me to vanquish the helplessness I felt after losing a child. I also hoped by writing about my experiences, I could support and inspire other parents dealing with similar issues. My children understood that writing about them helped me to heal the deep wounds I carried. But I respected their wishes for privacy and deleted everything about them later on. Now I ask them for permission to share pictures and words. All these years later, I can celebrate and put the trauma of contentious meetings, court dates and endless paperwork behind me. All three of my children have bright futures and overcame huge hurdles. They are beautiful humans beings I treasure. When I was an advocate, I learned everything I could in order to help them. I was also blessed because I met a wonderful woman who guided me. The school district put many obstacles in my way. I watched other parents give up so many times. No roadblock stopped me because I found another path each time. If I knew something would help my child, I was determined to get it. I never lost because I never gave up. 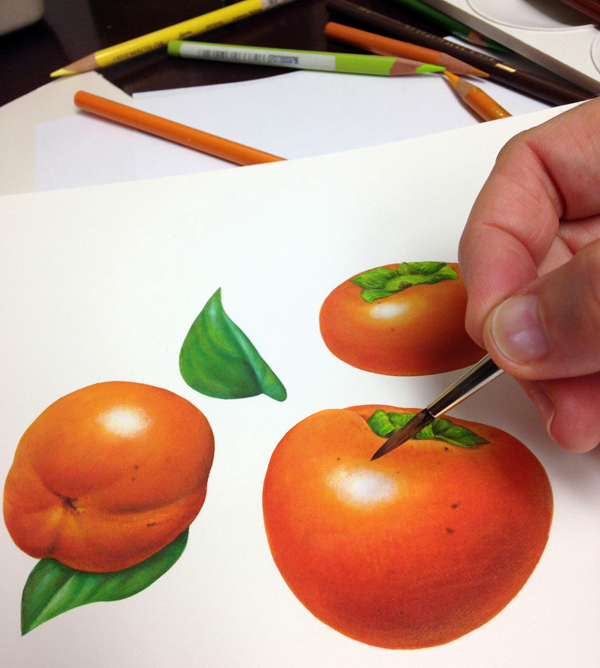 Last week, I pulled out my paintbrushes for the first time in five years to illustrate persimmons. I’ve been illustrating many fruits and vegetables for a large project. It has involved spending a lot of time on my computer and unfortunately, my eyes have been very irritated and foggy. It’s difficult to open them when I go outdoors. Social situations are tough for me. I have trouble concentrating and feel vulnerable. Staying safe at home is much easier. But recently, there were a lot of situations I couldn’t avoid and I made the best of it. 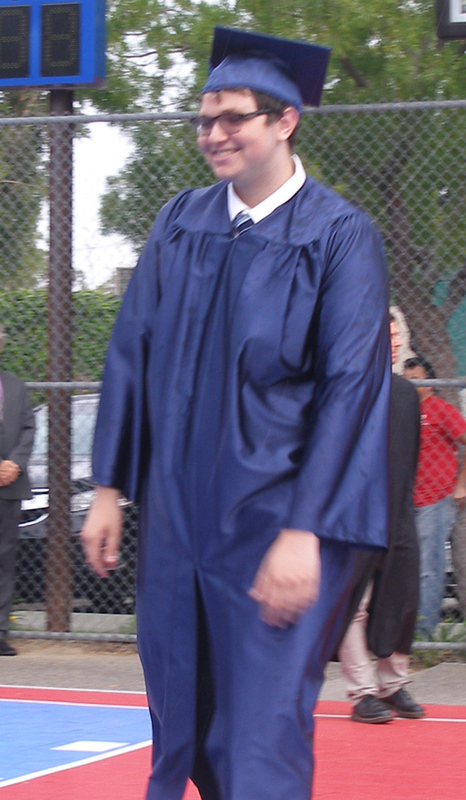 Many events were due to the fact that my youngest son was graduating high school. He attended a small private school and in the fall he was going to a nearby community college. From the time he was in first grade, he’d never been in a class with more than 10 students. He was excited and nervous about the new learning experience ahead of him. Two weeks ago, I went to the last school meeting I would ever have to attend for a child of mine. I showed up to that meeting in casual clothes. I wished my eyes would stop tearing; that alone had me feeling emotional. I was grateful that my painful memories of wrestling with the school district had completely faded away. I had nothing with me except my purse. In the past, I would have brought a tape recorder to that meeting. I would have lugged a huge notebook with outside reports to build my case. I would have lawyers waiting for me to bring them a copy of my child’s education plan. This meeting was an opportunity for me to say goodbye to the school district forever. They also were bidding him farewell. I thanked them because my son had blossomed in this wonderful school, which I had fought so hard to get him into three years earlier. But there was something I needed to say. I was frustrated because my son hadn’t taken all the placement tests for the community college he’d be attending. He had missed the early registration deadline that he was entitled to. I announced aloud that I wished the school could have encouraged him to do those things earlier this year. Clearly, I was not on top of this and admitted it. In the past, my father had mentored my oldest son. He took these things off my shoulders. Oh, how I missed him! 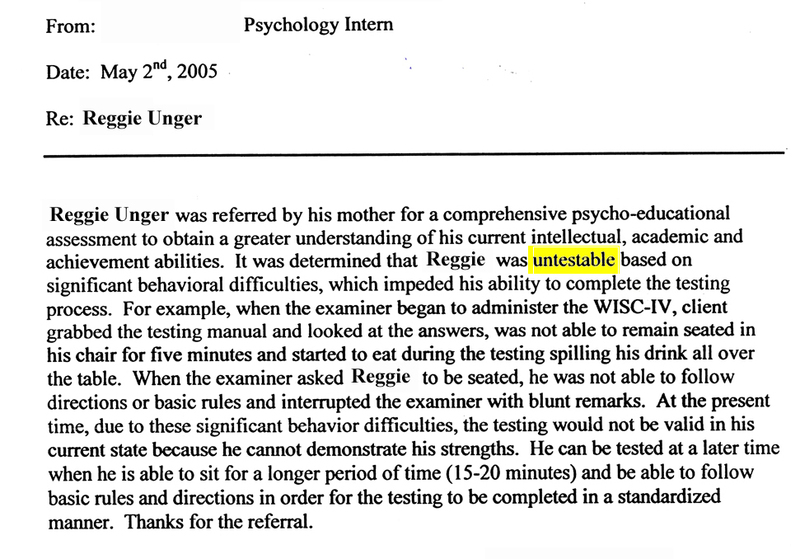 I was furious when the school district called my son “untestable.” Ten years later, he became a model student and often helped other children. For my blog, I called him Reggie. I love this picture of my three children. I understood. Life transitions are exciting and scary. 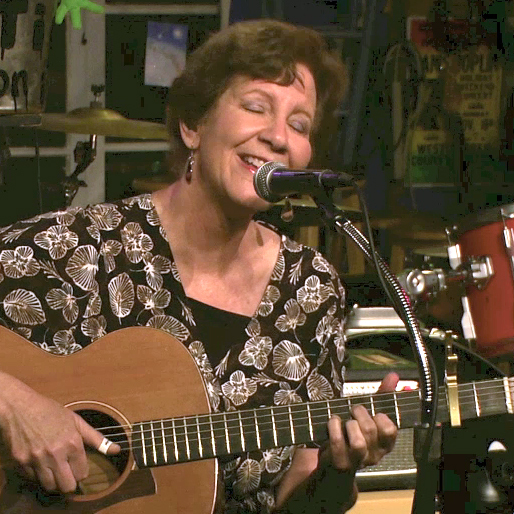 Because I am a passionate songwriter, I live my life as a musical. My latest song that I have been working on is named “The Door.” My new version moves me and gives me a lot of insight; I’ve even rewritten some of the lyrics. 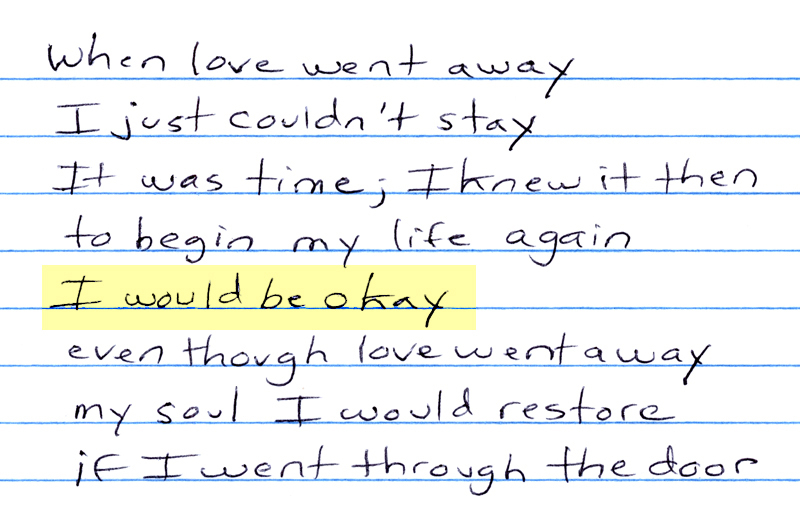 When I decided to end my marriage after 31 years, it was terrifying to “go through the door.” I wrote my song before I announced that I wanted a divorce and it helped me find my courage. I see a door not as an exit – but as a entrance into somewhere new. And recently, I have been opening many new doors in my life. It hasn’t been easy because my eye condition inhibits me and it takes incredible energy for me to do new things. I believe this is a time where I deserve peace and healing. I use a lot of positive thinking to help me. The beautiful part about working on this particular song, was realizing that I was sending my youngest son through his own door by empowering him to do things for himself. And I marvel when he lectures me (like teenagers do) and tells me the very things I’ve taught him. I positioned my sunglasses so the light wouldn’t cause me more pain. I sat through the assembly with my eyes almost closed. It was a long event – almost 90 minutes. Music was playing in my mind and I was excited to discover some great lyrics that would work well for my latest arrangement. Then I heard my son’s name. He was receiving an award and it was for best achievement in music. I was taken by surprise because he wasn’t even in a music class this past semester. And a few moments later he received a second award. This one was for musical theatre. I grinned. My son loved to be on stage and had a beautiful tenor voice. It looked like the school had recognized his musical talent. 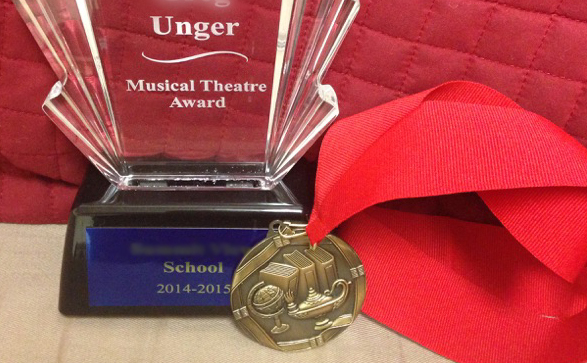 Two music awards and seeing my child’s face aglow – nothing could be better than that! 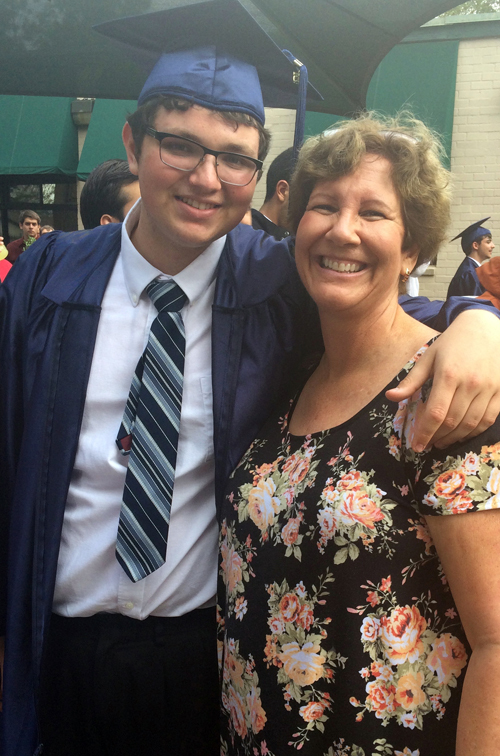 Graduation day was a big day for my son. For me, it meant seeing my former husband for the first time since signing divorce papers at the courthouse 18 months ago. I tried not to anticipate or feel anxious. It helped that my brother and sister-in-law came to pick me up. My son had invited them to come and initially I had discouraged it. It was because I didn’t want to inconvenience them. I told my son it would be more intimate to celebrate with his aunt and uncle later on in a restaurant. 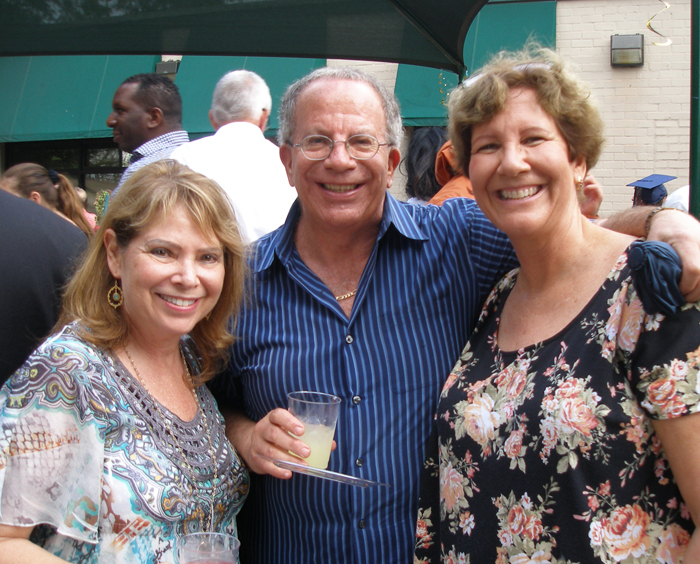 It was wonderful to be with my brother, Norm, and sister-in-law, Jo on that day. 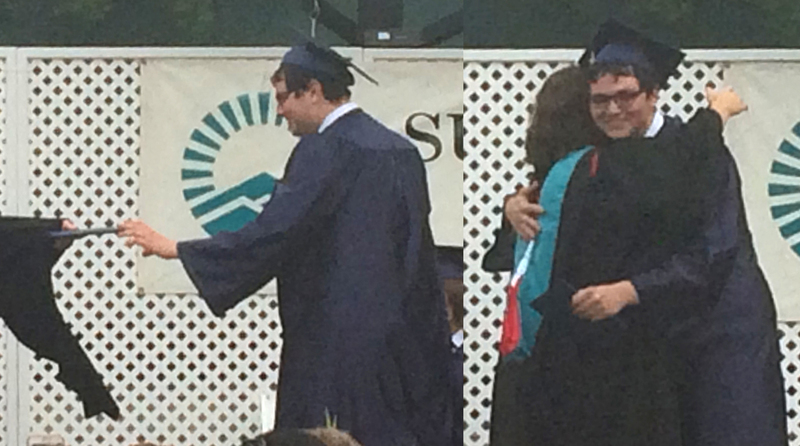 I tried not to think too much about my oldest son’s graduation from that same school six years before. The pictures taken that day were precious ones. There was one of my dad; I used it for a poster that was displayed at his funeral. Our former housekeeper, Rosa was there. Her grandson was my son’s best friend and his name was Jason. My oldest son also had two very close friends named Jason. That name was one I heard often, and I didn’t mind it at all. It was strange how on a day in early June – it was raining. I didn’t even bring a jacket with me and the warm raindrops splashed on my face and hair. 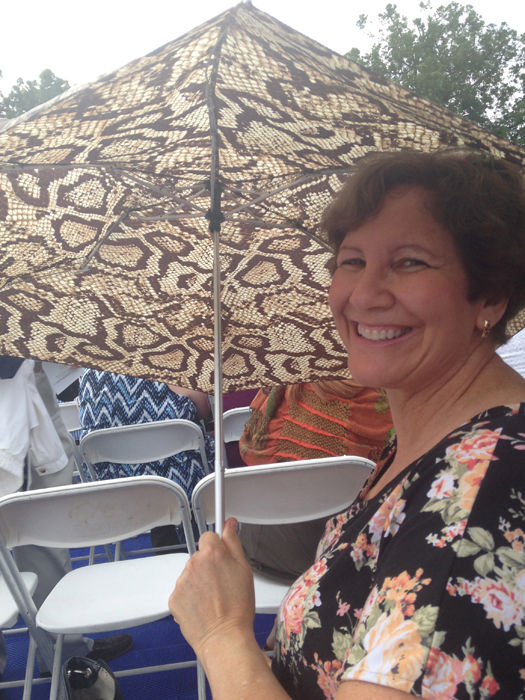 I didn’t bring an umbrella, but my sister-in-law let me use hers and she shared my brother’s umbrella. I followed my brother and sister-in-law into an auditorium where people were waiting for the graduation to begin. I was in a fog, blinking slowly and breathing carefully to maintain peacefulness. I heard my ex-husband’s voice; he was standing and speaking to my oldest son. Norman and Jo walked over to shake his hand and say hello. They probably hadn’t seen him for 3 years. I was behind them and when he looked away, I froze and then did the same thing. Time ticked by slowly as I made small talk and waited to move to where the graduation was. We were only ten feet apart and pretending that we didn’t see each other. Our group found seats and my two older children sat behind me; my ex was on the other side of them. The pretending continued. The rain showers came in bursts. I decided the soft drops were like tears from above and I added my own to them. The graduation was beautiful. Despite fog and numbness, I couldn’t help but feel teary seeing my son’s shining face. He was so happy and it was definitely his day. The ceremony was almost over. How did I want to think about this day and seeing my ex? He was soon moving far away to another country. It would be a very long time before I might ever see him again. I didn’t feel guilty. I wasn’t sad or worried about him. I wasn’t angry with him. I was numb and in a fog, devoid of feelings. But I did know one thing for certain. 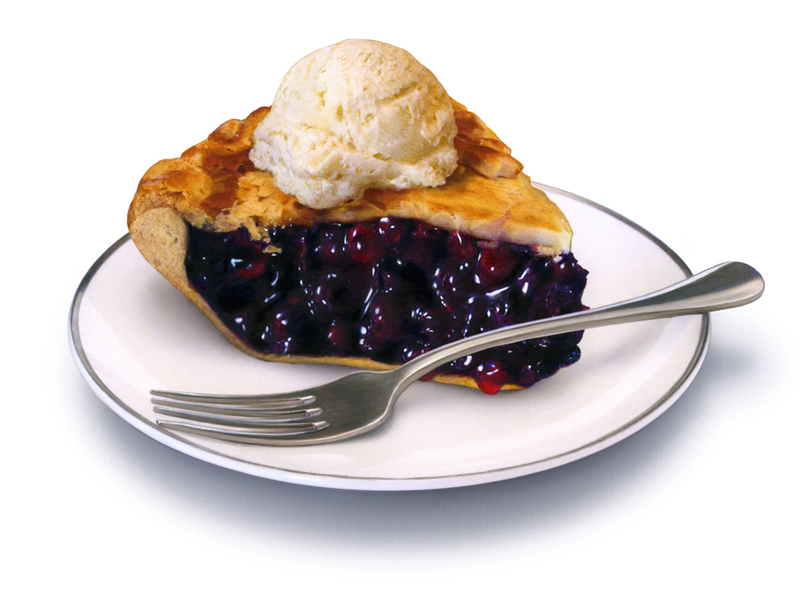 I didn’t want this day to carry memories of painful avoidance. I decided to step through a door. 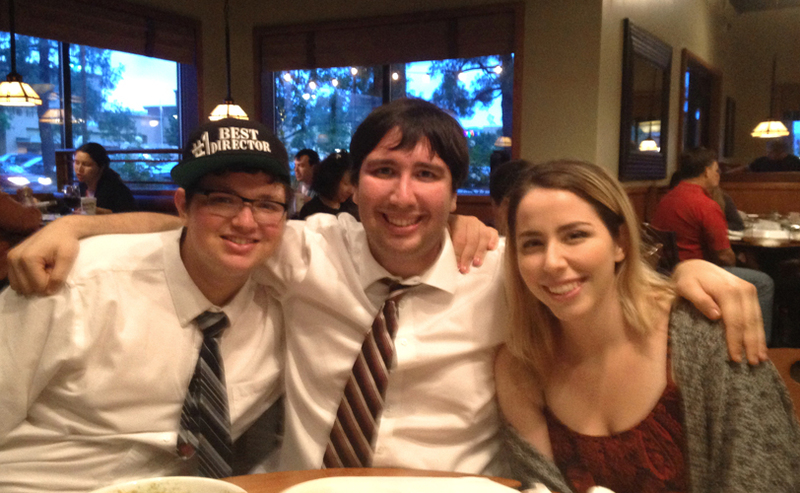 This time I was in the picture with my children at our “after graduation” dinner celebration. The dinner afterwards was exhausting for me. I had hoped my grown up children would get along like they usually do now (after years of terrible sibling rivalry.) But they squabbled on the way to the restaurant. 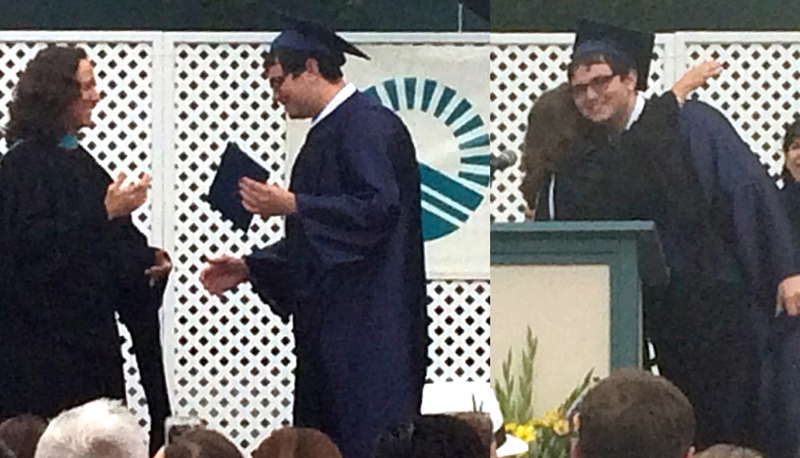 I was supposed to hold onto my son’s diploma, which he handed me in a nice leather folder. But I lost it and it was very upsetting. I could write another story all about that. Joy and pain – numbness flattens them both. I felt fairly flat. I made it through and felt tremendous relief. But my feelings weren’t nearly as important as knowing my son had the most wonderful day. I smiled and waited for his answer. This entry was posted in Uncategorized and tagged acoustic guitar, adjusting to divorce, Advocacy, begin my life again, composing, coping with divorce, creativity, divorce after a long marriage, ending a marriage, facing divorce, graduation, graduation celebration, gray divorce, guitar, heart break, I went through the door, inspiration, Judy Unger, leaving a marriage, loss, lyric development, lyric writing, marriage breakup, marriage ending, mother and son, Music, original songs, School district issues, seeing an ex, separation, separation and divorce, singing, song arrangements, songwriting, the door, unhappy marriage, untestable, When I close the door, when love went away, writing. Bookmark the permalink. you are such a good mother and i am so glad that you are teaching him how to be an adult. He’s also teaching me. Glad I could share such a beautiful thing. Thank you for your love and hugs – I can feel it. I am so blessed by your support. Looking forward to visiting you soon! Thank you, Julie. It was so sweet to wake up this morning to a message from both you and Sandra telling me you’re “speechless.” Well that is such a high compliment and I’m honored. It is such a blessing to have a friend across the world like you supporting my words. You are not speechless! You are brilliant with your praise and sweet adjectives. Your comment has me all teary. It was so hard to write that story, but it felt good. I love sharing the progress I see all around me – in my soul and in my children. You are dear to me and I treasure your words. You made it wonderful by being there for me. I am so glad that Greg insisted on inviting his aunt and uncle. I missed mom and dad but having you there meant the world to me. Thank you, Norm (and Jo), for all of your enduring love and support. I am blessed. As usual, a beautiful story by a beautiful woman. Your son looks so happy; a proud momma you are! Thank you, Jeanne. 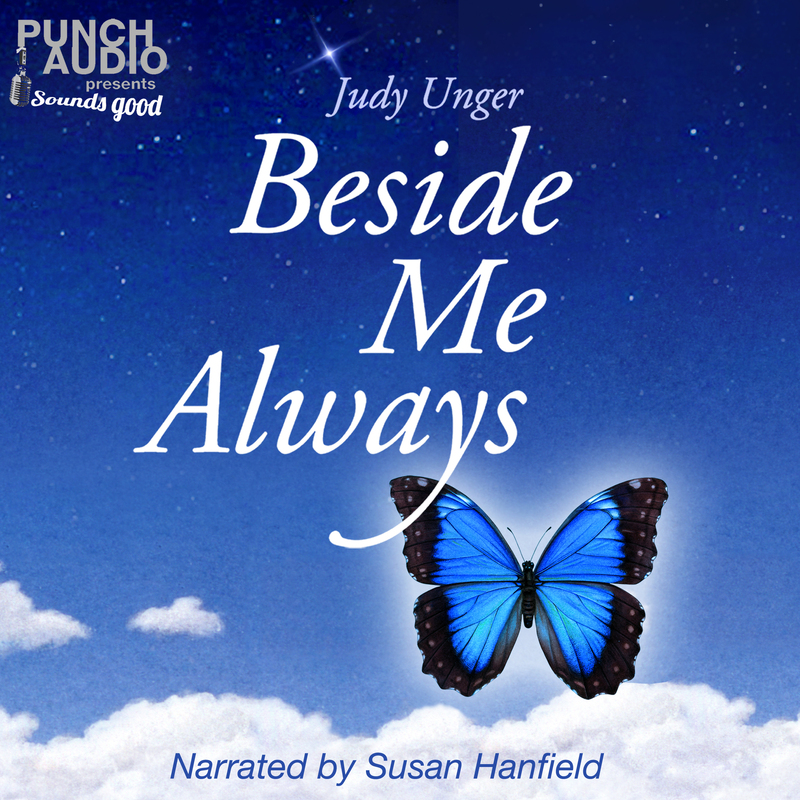 I feel so close to you and am thrilled to share the wonderful part of my journey. I am grateful we reconnected.